The units, which were produced in Hamburg, have been developed especially for use in Data Centers and industry and satisfy all requirements for efficiency and reliability. Featuring high-quality components and an innovative product design, the CyberCool 2 boosts the energy efficiency of your air conditioning system to the max. During the development of CyberCool 2 high-end chillers, no downtimes and absolutely reliable 24/7 operation in the Data Center were the primary objectives. 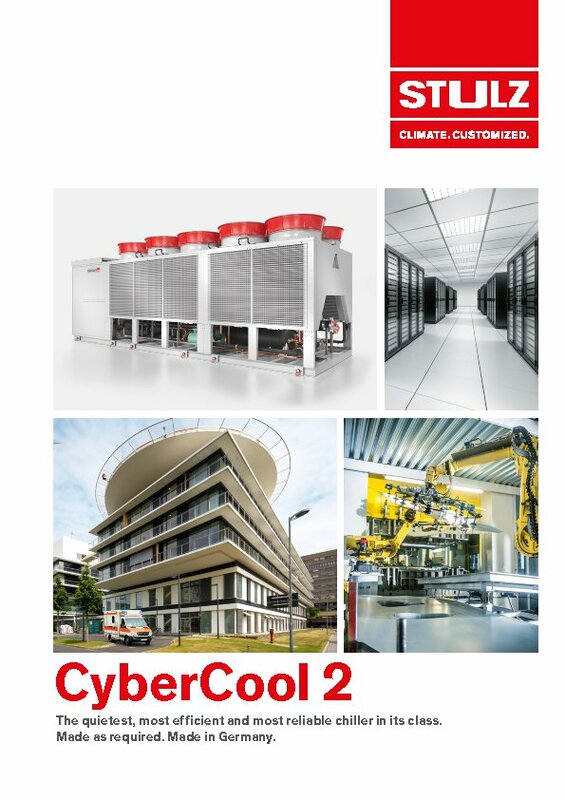 The CyberCool 2 is ideal for integration in existing systems and can be controlled to perfection by the STULZ control system. Use is made exclusively of system components commonly available on the market and adapted for industry. This ensures the best possible spare parts supply and constant availability. Every CyberCool 2 is tested in mechanical and electrical test runs to ensure perfect function and performance. Fans maximized in size enable quiet operation, optionally with speed reserves, and additionally bring about lower electricity consumption. Overdimensioned evaporators allow a variable flow rate and keep running costs to a minimum. Maximized condensers and Free Cooling surfaces help to extend the Free Cooling time, enabling even more energy efficient operation. Maximized condensers and Free Cooling coils provide a generous air impact surface, enabling even more energy efficient operation for compressors and Free Cooling mode, thanks to early switching points. Variety of options for the CyberCool 2. The quietest, most efficient and most reliable chiller in its class. Made as required. Made in Germany.